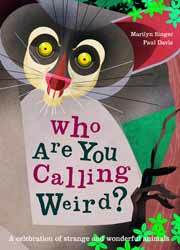 Who Are You Calling Weird is large format hardback book aimed at the young reader (or for parents to read to their young). It explores our wondrous world, examining some of the weird and wacky creatures that inhabit it, but seem to have come straight out of a sci-fi novel. Some you'll have heard of: Platypus, Narwhal, Kiwi. Others may be new to you: Dumbo Octopus, Hairy Frog, Hairy Frogfish, Leafy Sea Dragon. Each entry is accompanied by a wonderfully large and humorous illustration by Paul Daviz. While it would have ruined the design of the layout, a photo of each creature would have helped (although you can always search the Internet for that) as some of the illustrations don't really do the creatures justice. Each entry outlines where on the planet the creature lives, its natural habitat and some fun facts about them. It's a great read - whether for bedtime stories or just to educate your youngster of some of the more strange creatures that we have living on Earth.